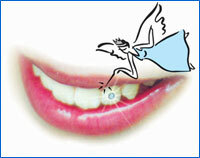 About us - Tooth Fairy GmbH - "Style Your Smile"
Holly Schroeder created ToothFairy™. She is a dental hygienist from Canada, who has been working in Switzerland since 1997. Thinking a crystal being placed on the tooth would be a great fashion accessory her idea became an instant success when applying them at a rock concert in 1999. With Holly’s vision “you don’t need to be a dental professional to apply the Tooth Crystal”, ToothFairy™ was born. Established in August 1999, the product “The Tooth Crystal Starter Kit” was ready to go on the market. Thinking the hair and beauty market was the perfect place for this product she attended her first beauty show at the GMEX centre in England (Sept 99). This was to be the start of several successful exhibitions in various parts of the world. The trend began, women and men, all over the world started going crazy over the ToothFairy. Now the head office phone rings constantly from people all over the world ordering their kits from nail technicians to hairdressers, from beauticians to spa owners from dentists to tattoo artists. ToothFairy™ has been acclaimed in European editions of Woman Magazine, Elle and Cosmopolitan and now appears in businesses around the world. Due to the popularity of Professional Tooth Jewellery, ToothFairy™ continues to bring the latest trends to your establishments and has expanded into Tooth Crystal Home Kits and Tooth Whitening.